natural flavor 600mg, natural cocoa powder 500 mg, xanthan gum 350mg, monk fruit extract 170mg, stevia leaf extract 125mg. Add one scoop to 6 ounces of cold water or your favorite beverage to a shaker cup or blender and mix for 25-30 seconds. Vary the amount of liquid to meet your desired taste and consistency. Drink 1-3 servings daily or as needed to satisfy your protein requirements. Using nonfat milk instead of water will give you a thicker, creamier shake. Proprietary blends or amino spiking. We provide full label/ingredient disclosure on our Grass Fed Whey Isolate. No games, no tricks-just the purest, freshest whey isolate available. No other macronutrient is more essential to muscle growth and recovery than protein. Research shows that active individuals need 1.5–2.2 grams of protein per kilogram of bodyweight daily for optimal nitrogen balance and to promote muscle growth/recovery. * This amount is often difficult to meet through a balanced diet, which is why individuals often turn to whey supplementation to support their protein requirements. However, not all whey proteins are created equal. In a market saturated with hundreds of whey proteins, it is hard to know that what you see on the label is what you are actually getting. Many companies use confusing labels and deceptive claims to hide lower quality proteins and cheap ingredients. Therefore, full label disclosure, quality, digestion rate, and preparation method should all be considered before selecting a whey protein. The most common forms of whey are whey protein isolate and whey protein concentrate. Whey protein isolates digest and absorb rapidly and are, gram for gram, the purest form of protein available (90–98% pure protein). This level of purity is achieved through a cold cross-flow micro- and ultra-filtration process that removes the larger, less-absorbable protein molecules while also filtering out fat, lactose, and ash that can be present in whey concentrates and substandard protein powders. Furthermore, this process does not denature the valuable proteins and peptides in whey, so the protein itself is of a higher quality. Studies suggest the ingestion of fast-acting protein sources, such as whey isolates, can increase amino acid levels in systemic circulation and stimulate robust increases in protein synthesis, arguably the most important physiological factor in existence when it comes to muscle growth, strength, and recovery. * What's more, since whey protein isolates are generally low in carbs, lactose free, fat free, cholesterol free, and gluten free, it makes it the perfect choice for low-carb dieters, lactose intolerant individuals, or athletes who want to get ripped while packing on muscle. Simply put, isolates are the king of the whey protein jungle. On the other hand, whey concentrates contain less protein on a gram for gram basis. The process used to create whey concentrates does not go through as many fine filtration steps, resulting in a product that can be anywhere from 25–80% pure protein. Furthermore, whey concentrates, due to the filtration process used, contain higher amounts of fat, cholesterol, and lactose, which may not sit well for some individuals. With each serving of NutraBio Grass Fed Whey Isolate, you can be confident you are getting 25 grams of the cleanest, purest protein on the planet. What you see on the label is exactly what you get. No whey concentrates, proprietary blends, amino spiking, dextrose, fillers, or other potentially unhealthy or unneeded additives. It contains only the highest quality non-denatured whey isolate that provides a perfect amino acid profile for optimum nitrogen retention, protein synthesis, and muscle growth. 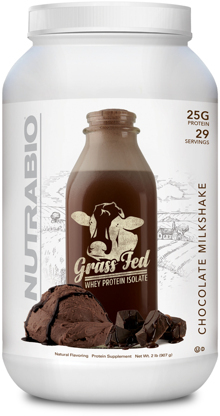 * NutraBio Grass Fed Whey Isolate is THE ultimate lean muscle protein.